Once in a while I’ll revisit weird accomplishments I thought might happen, like a team winning more games than the Celtics and Lakers combined, or impressions left on me in the beginning of the season, like Josh Smith’s once-promising shot selection. Today I’ll revisit the possibility I brought up over two months ago of Roy Hibbert blocking more shots than an entire team. If that sounds like a lofty accomplishment for the Pacers center, that’s because it is, but it’s not impossible. The last time a player recorded more blocks than another team was in 2009 when Dwight Howard had 231 blocks to the New York Knicks’ 204. New York, coached by Mike D’Antoni with a starting frontcourt of David Lee and Al Harrington, set the record for the least blocks during an 82-game season, though it wasn’t much better the season before when they were coached by Isiah Thomas. The Knicks of 2008, with a frontcourt of Zach Randolph and Eddy Curry, blocked just 213 shots. Josh Smith (227 blocks) and Marcus Camby (285) outswatted that squad and then some. At the time of the first post, two squads this season were in danger of becoming like the Knicks of the late-2000s: the Kings and Timberwolves. Hibbert had 62 blocks to Sacramento’s 48, though Minnesota was within distance without Ronny Turiaf and their starting frontcourt of Kevin Love and Nikola Pekovic not posing much of a threat above the rim. As for the Kings, they had frontcourt depth consisting of DeMarcus Cousins, Chuck Hayes, Derrick Williams, Patrick Patterson and Jason Thompson. They come in all shapes and sizes, but none are elite shot blockers. Hayes and Patterson would eventually be traded for Rudy Gay. Meanwhile, Hibbert was also just coming down to earth after recording 4.3 blocks per game over 30 minutes in his first 13 games. His block percentage while on the court, 10.2, had only been done over a full season six times with five coming from Manute Bol, and the most minutes played during any of those seasons was 26.1 during Bol’s 1986 campaign. Naturally, Hibbert’s block totals started to average out. He only had seven over his next six games and just two combined against the block-prone Bobcats and Timberwolves (Hibbert was also blockless Wednesday night in his second matchup against Minnesota). His block percentage during that six-game span was 2.7, right around the same percentage Paul Millsap and Chris Bosh have recorded this season. That’s not bad, but it’s also not even half the frequency Hibbert logged last season. Note: Now is probably a good time to mention I’m not saying Hibbert or anyone else is a bad defender if/when they don’t block shots. They obviously don’t measure everything about inside defense and the same goes for looking at steals to evaluate perimeter defense. In fact, it’s pretty noticeable that Hibbert would rather be in position to use verticality to his advantage than go for a block and risk fouling. I’m also not exactly rooting for Hibbert or anyone else to block more shots if it comes at the expense of good, sound defense. It’s not the end of the world if someone does or doesn’t block more shots than an entire team, but it would be fun to talk about if it happened. Obviously, for me it’s been worth dedicating at least a couple posts just about the potential of accomplishment it. So Hibbert went through a heater of some sort in the block department and then hit his version of a valley, averaging out to a block percentage of 8.1 through his first 18 games, according to Basketball-Reference. That rate, or one a sliver below it, would have to be sustained for a whole season to outblock a whole team. Howard, Camby, and Smith were 1-2 percentage points lower, but all played a handful more minutes per game and Camby’s Nuggets played at the league’s fastest pace in 2008. Indiana’s currently in the middle of the pack this year at 96.08, according to NBA.com, but no faster than the Kings or Timberwolves. Hibbert’s block rates couldn’t hold up over his next 36 games, however, blocking only five percent of opposing shots in the same 30 minutes per game. For the season, his block percentage is 6.1. He’s been surpassed by a few other players in total blocks, and teams he once competed with such as the Kings and Timberwolves have since upped their blocks. Every team but Minnesota has totaled more than the 2009 Knicks did over 82 games. Below is a table with Hibbert, a few other leading blockers, and four teams with the least blocks per game. * – according to Basketball-Reference. Minnesota’s still far behind even the second-worst Cavaliers but they’ve blocked 5.4 shots per game in February, a top-10 mark in the league. They’re also in the top five in opponent field goal percentage around the rim at 57.4, though they allow the fourth most attempts so I’m not sure that’s worth the tradeoff (as well as playing without Pek). Indiana, meanwhile, has been suffocating as they’ve held opponents to just 49 percent. 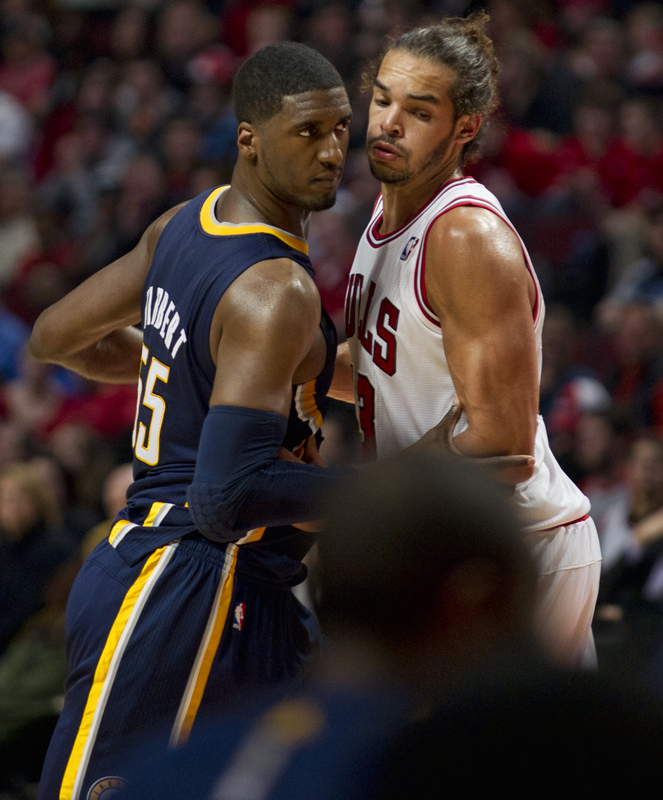 I’m pretty sure Hibbert and the rest of the Pacers will take that in exchange for less blocks. As for the players listed, it would’ve been fun if Anthony Davis were healthy the whole first half of the season. Add another 30 blocks to his total and it at least makes things interesting, especially if Cleveland continues their recent low tally in that statistic. Going forward, Davis and Jordan look like the best bets to block more shots than a team. As mentioned before, Hibbert has understandably looked to use verticality to his advantage rather than get a hand on the ball and risk foul trouble. Davis and Jordan are far more mobile and freakishly athletic to recover from situations where they’re either beat or hair late on a rotation to a driving guard. They also play in that 35-minute range that allows them more opportunities to tally blocks. If I had to choose one or the other, though, it’d be Davis because of the likelihood his minutes not only stay the same next season but also increase. He’s also basically untradeable, something Jordan can’t say himself. Who knows if Jordan plays 36 minutes under most other coaches, which would keep him from flirting with 200 total blocks in one season. Potential wildcards next year: JaVale McGee, Andre Drummond, and Larry Sanders. I like all of them when given the playing time and good health by the basketball gods. This season seems like a lost cause, though, which means the search for other weird stats continues.